The Art Nouveau Era was one of great opulence. Having been developed in France in the late 1800s to early 1900s, this period saw influence from the great societal changes occurring in the country. With women seeking further rights, to both education and employment, experts believe this is why many of the iconic pieces were so women-centric. A key influence of the period was renowned Czech artist Alfons Maria Mucha (1960-1939). Having a distinct style and effect on the period, Mucha was best known for his array of paintings, illustrations, advertisements and designs depicting a woman. 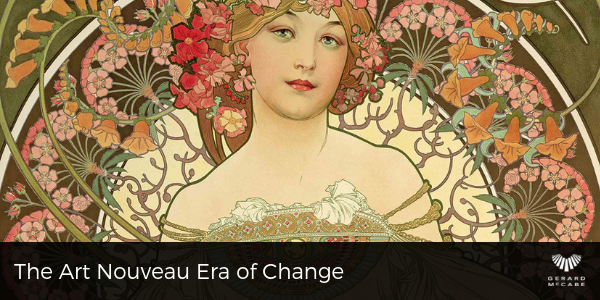 Being heavily influenced by the theatre, Mucha was responsible for the famous depiction of actress Sarah Bernhardt. The successful illustrator represented Bernhardt with curving designs including floral and oriental elements, along with mystifying circular jewellery designs with pearls and gems in pastel shades. 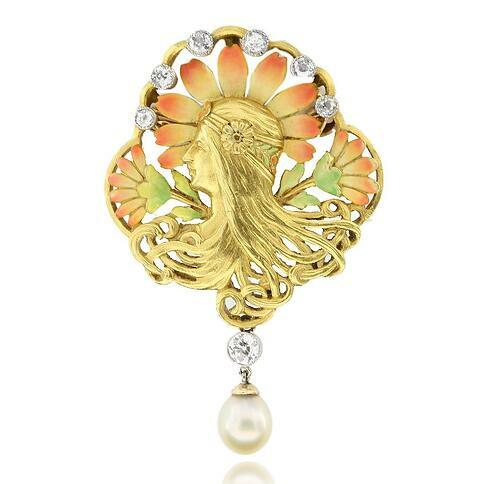 With this in mind, the Art Nouveau Brooch, pictured above, comes into focus. With the forefront of the design featuring a striking woman at its centre, Ashton from our Adelaide Arcade boutique saw similarities to Mucha’s work, and couldn’t pass up the opportunity to share it with our readers. 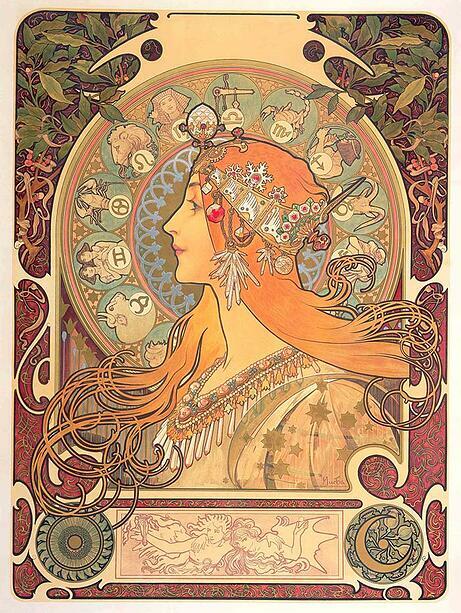 Ashton was able to draw similarities to the famous Mucha painting, Zodiac (1896) (pictured above), which depicts a woman with an array of unique attributes. The long, flowing golden hair, intricately detailed headband and sphere of zodiacs; the similarities to the brooch are uncanny. The floral attributes surrounding the woman are a testament to Mucha’s rich imagination and the use of interesting grooves within the piece only further enhance the artist’s depiction of a woman’s features. The glistening diamonds sit where the zodiacs are, and the hair is gracefully entwined with the golden frame of the brooch. It’s as if it has a mind of its own, the strands of gold appear to be dancing by themselves. The use of enamel has further expressed the beauty within this brooch, enhancing its similarity to that of Mucha’s creations. "Her profile, the direction she’s looking, the arch and when all of this is paired with the hair, it’s very much a Mucha-inspired creation,” believes Ashton. Ashton has always been a fan of Mucha’s posters, and when she and Justin McCabe began researching this brooch, Mucha’s jewellery boutique in Paris was discovered. Henri Vever, a prominent early 20th-century jeweller, described this treasure trove as a “sumptuous installation of unprecedented and refined elegance”. Taking this into consideration, it’s not surprising that this French, Art Nouveau Brooch seemed more Mucha then initially thought. Everything within this brooch is moving and growing; it’s very organic. Just like many of Mucha’s paintings, they all feature natural elements. - describes Ashton. The substantial history and monumental key events through the specific Art Nouveau Period, is what gives the collection such significance and importance.